Home » Vinesh Phogat first Indian to be nominated for Laureus World Sports award! Vinesh Phogat first Indian to be nominated for Laureus World Sports award! Ace Indian wrestler on Thursday became the first Indian to be nominated for the prestigious Laureus World Sports award. She has been nominated for “Laureus World Sporting Comeback” category for the year 2019. 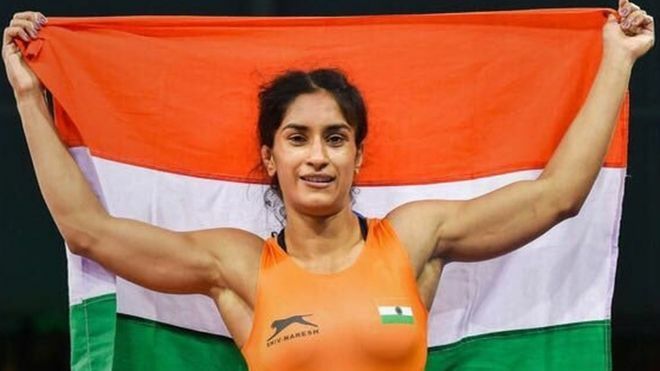 The 24-year-old Indian has made a sensational comeback after battling a long injury lay-off to clinch the gold at the Gold Coast Commonwealth Games. The Haryana wrestler became the first Indian sportsperson to be nominated for this award along with the likes of 14-time major winner golfer Tiger Woods, two-time winter Olympic medallist Mark McMorris of Canada, 3-time Winter Olympics bronze medallist Lindsey Vonn of USA, two-time Winter Olympics champion Yuzuru Manyu of Japan and three-time Winter Paralympics champion Bibian Mentel-Spee of the Netherlands. “I didn’t know till today that such award exists. To be nominated in the sporting comeback category reveals the struggle I had to undergo after my injury in the Rio Olympics and I feel privileged to win medals for the country. To be nominated along with great Tiger Woods and other champions feels special for me and I hope I can win it. Even if I fail to win this award, I am sure this will be an inspiration to the many youngsters in our country”, said Vinesh on Thursday. The last time an Indian Sporting feat made its way to the Laureus World Sports Awards was in 2004 when both Indian and Pakistan Cricket teams shared Laureus Sport for Good Award for playing the international match despite the political situations between the two countries.